Tapophile? Ghoul? Trespasser? I’ve been called all of these things because of my devotion to studying the history of First Calvary Cemetery in the Blissville neighborhood of Long Island City. 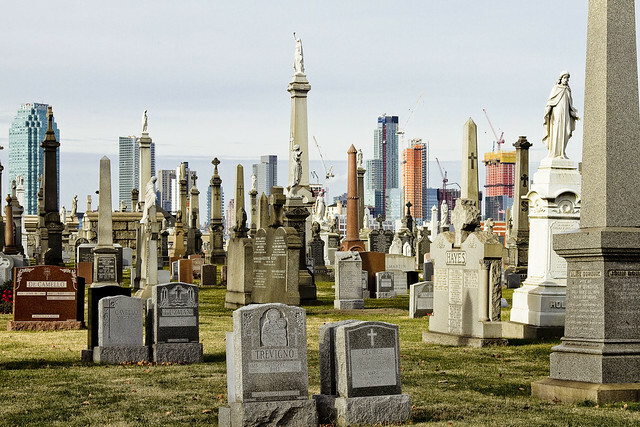 Calvary Cemetery, for the uninitiates amongst you, was founded by the Roman Catholic Church in 1848 to comply with New York City’s “Rural Cemetery Act” which proscribed the continuing interment of cadavers in Manhattan due to fears of contagious disease. Prior to this, it was common for churches to have graveyards, and far more common was the usage of the dirt floor basements of tenements as ad hoc burial spots for the poor. The law commanded all the major religious denominations to acquire and maintain cemeteries in “rural areas” to house their congregants – which at the time – was a description that included the south eastern corner of Blissville near its border with the Berlin section of Maspeth. 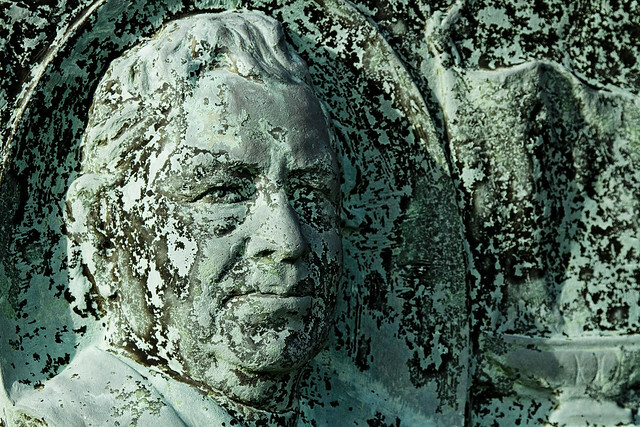 The cemetery was consecrated by Archbishop “Dagger” John Hughes in 1848, and there are literally millions buried in this – the original property – and in the nearby Second, Third, and Fourth Calvary Cemeteries. The law also requires the disinterment of buried bodies, which was a ghastly process that occurred in the dead of night, and vast numbers of human remains were removed from their Manhattan graves and barged across the river for reinterment in the new rural cemeteries. 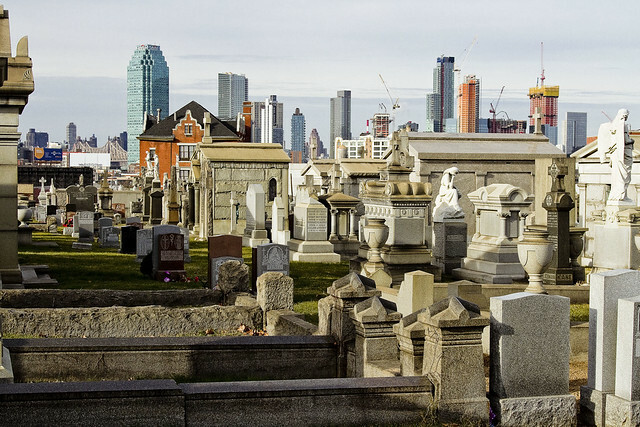 There are so many cemeteries in the surrounding neighborhoods of Brooklyn and Queens that the term “cemetery belt” is commonly used to describe the vast acreages of graves. All of these are not Roman Catholic ones, of course. There’s a cemetery for everyone. For Catholics, however, all roads lead to Calvary. 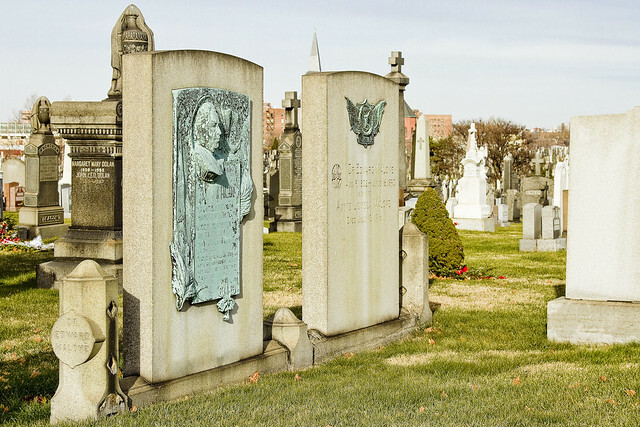 Calvary Cemetery was founded, and continues to be maintained, by the Roman Catholic Church – specifically by the Trustees of Old St. Patrick’s Cathedral in Manhattan, and it is a very special place. The Trustees consider the cemetery to be an extension of the altar at the Cathedral. To one such as myself, Calvary is a history book, left sitting wide open and found along the Queens shoreline of the noisome Newtown Creek. Your best bet is to wander in here, roam around a bit and see what you can see. If you come here looking for something specific, it’s going to be quite frustrating. Let the place talk to you, and it’ll show you exactly what you need to see – just like Queens itself. Don’t force it. Look up, down, all around. Notice things. If you take a hard look at these things, you might be offered a lost or occluded slice of the history of New York City. That’s the grave of the Malone family – Father Sylvester Malone, his brother Edward and his sister in law Annie. Slice. Father Malone… wow… it’s actually amazing to me that he’s not still spoken of in North Brooklyn. Beloved in life, Sylvester Malone was born in Ireland’s County Meath. 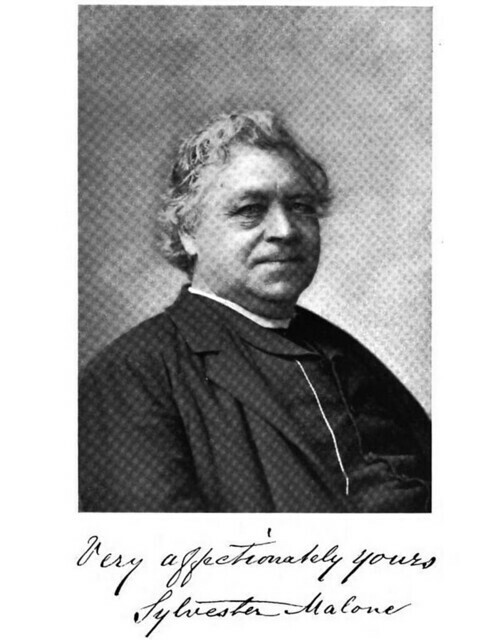 Malone was recruited to the priesthood by Reverend Andrew Byrne in 1838, and came to America with him. In NYC, Malone fell into the circle of priests surrounding Archbishop John Hughes, and was ordained at Old St. Patrick’s Cathedral in 1844. Malone was shortly assigned to Old St. Mary’s church in Williamsburg. Malone worked a Parish circuit that included the East River side of Newtown (including Astoria’s Hallets Cove) and the former Boswijck – or Bushwick – Colony, including Greenpoint, Williamsburg, and Bushwick. Malone formed a friendship with architect Patrick Keely (who also designed St. Anthony’s in Greenpoint and more than 200 other new gothic churches in the northeastern United States) and the two oversaw the construction of Sts. Peter and Paul church in Williamsburg, which Malone was permanently assigned to in 1852. Sylvester Malone. Pastor of St. Peter and Paul’s Church for fifty five years. Regent of the University of the State of New York. Live in Charity with all of your fellow citizens. A curse on prejudice and ignorance. Bane of the human family. As long as you have existence, there can be but little peace and charity. Malone was known for his open acceptance of people of other faiths, regularly attending the Jewish community’s Purim Ball, visiting the Masonic Hall, was an outspoken abolitionist, and encouraged his flock to perceive other faiths and cultures as neighbors rather than adversaries. Famously, he was one of the first Catholic priests to embrace the African Americans in his community, presenting honors to the Civil War’s Black Veterans Association. He happily interacted with Protestant denominations as well. While researching this post, some of the earliest usages of the term “tolerance” jumped out at me. You don’t hear much about the modern political concept of “tolerance” in the 19th century, and almost never from the pen of an Irish born Catholic priest based in industrial Brooklyn. Malone was also a regent of the State University of New York, and remained at Sts. Peter and Paul Church until his death in 1899. Unfortunately, the original building housing his church was demolished in 1957, so I can’t show you that. A modern church building sits on the old site, but the influential gothic design of the original is lost to modernity except for a few blurry old photos. There were three Malone Brothers, with Sylvester being the senior. Brother Patrick was the middle son and a Civil Engineer by trade, and Edward was the youngest. Edward fought in the Civil War, was a physician and surgeon of some renown, and died at the age of 52. Patrick and Edward actually died within a few months of each other in 1890. There was a sister too, but I can’t tell you anything about her, and I’m not sure if she ever left Europe or not. Dr. Edward Malone was born Aug. 5, 1832, and died June 16, 1890. 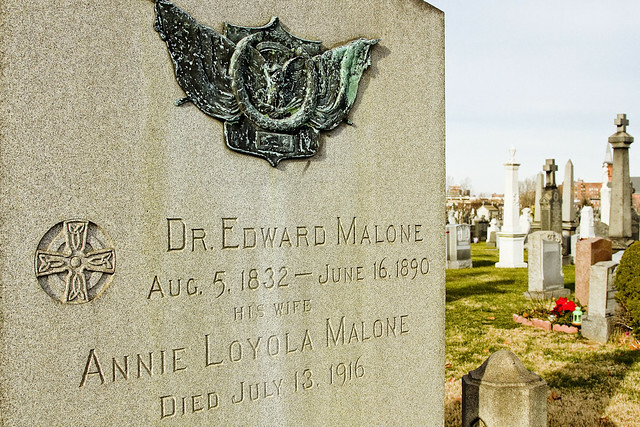 His wife, Annie Loyola Malone, died July 13, 1916. 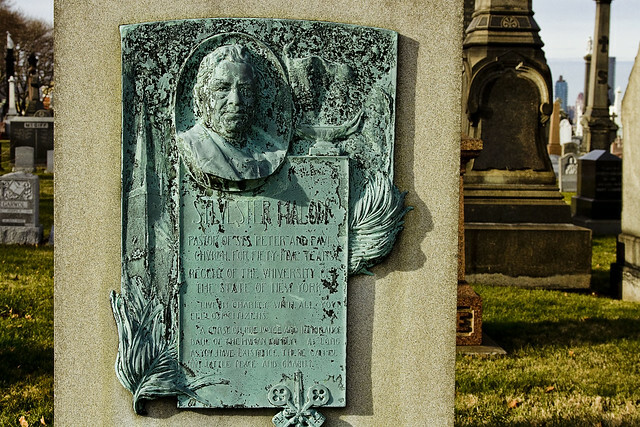 You never know what, or who, you’re going to find in LIC’s Calvary Cemetery. THIS time you have really outdone yourself. I am sending it to my people at BigBusToursNYC. Great research.